i finally got a wreath on our door. i've been wanting one since the beginning. it greets us every time we walk in the door. because we've made it through another day. own schedule next semester without supervision. i think i second that motion. it is quite a doozy. to mini bazaar before the show's over! southern cal looks better and better every day. oh i like your wreath. i have wanted one for a long time. so jason is taking the whole week off huh? not fun for you. sorry. Real pretty. Fall wreaths are the best! 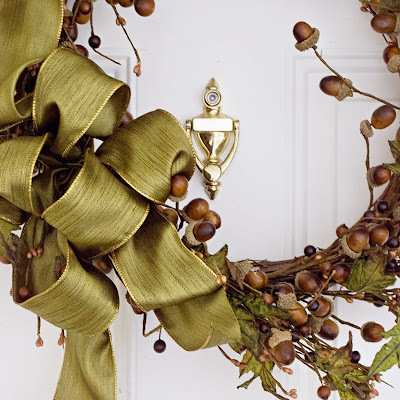 Wreaths are great, and Aunt Millie is right...."fall wreaths are the best!" That is one great bow! Sorry about your not trip to Cali. I love wreaths, too! Such a wonderful way to welcome people.